Place the eggs in a pot, cover with water and bring to rolling boil. Cover the pan and let stand off the heat for 10 minutes. Drain, crack the egg shells and soak in cold water to loosen the eggs from the shell. When cool, chop the hard boiled eggs. Char the red pepper under a hot broiler or over an open flame burner to blacken the skin. Place the pepper in a bowl and cover. Let cool to handle, then wipe off the skin. Seed and cut into thin strips. Meanwhile, melt the butter in a saucepot over medium heat. Add the pasta and toast to deep golden and fragrant. Add the rice and stock; stir. Bring to a boil and cover; reduce the heat to low and simmer for 15 minutes. Add a little water, if needed, if the rice absorbs all its liquid before becoming tender. Add the cut green beans and cook for 3-5 minutes more. Remove from the heat and let stand for 5 minutes, then fluff with a fork and place in a serving bowl. Add the capers, anchovies, onion, parsley, olives and tomatoes to the rice. Dress the rice salad with the juice of 1 lemon and the EVOO; season with salt and pepper, to taste. Arrange the rice on a platter, in individual plates, or in large hollowed-out tomatoes. 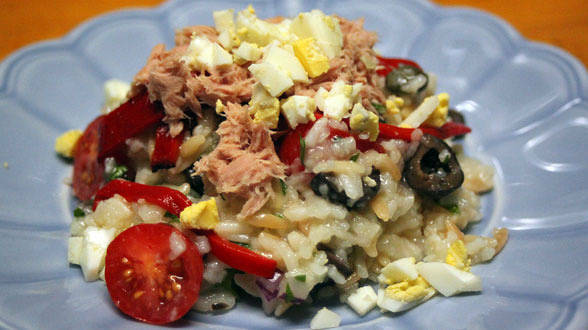 Top the rice salad with red pepper strips, chunks of tuna and chopped hard boiled eggs. Serve with wedges of lemon alongside to dress the tuna. In Recipes-list.com we have selected the most viewed recipes from category - uncategorized . Enjoy the best recipes specially selected for you! Riso alla Nizzarda is the right choice that will satisfy all your claims.